Oh Dog! It’s my Gotcha Day and I am so excited! Happy birthday to me! I’m happy as can be! Cuz I know I was wanted in my family! The best part is sharing them with friends and family! Well, SOME of us are wearing hats. The cats didn’t care for them. 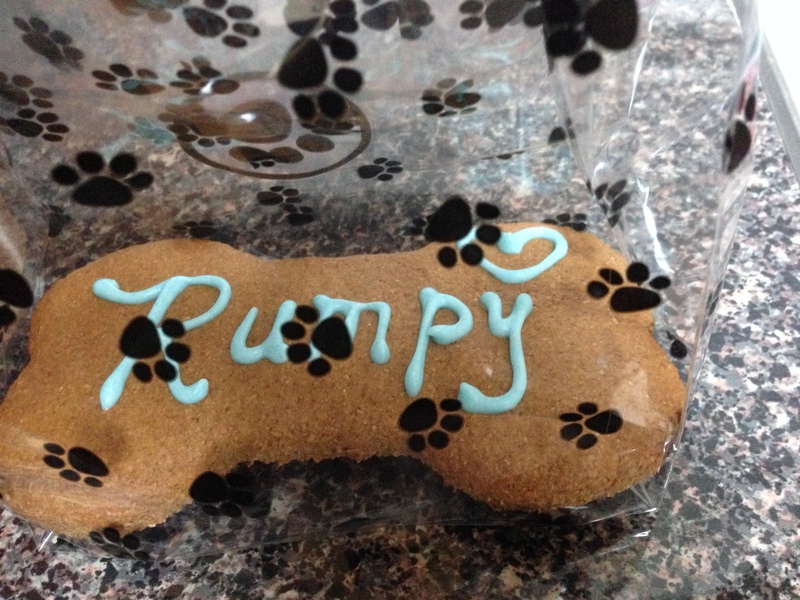 For Pets’ Sake gave me a cookie with my name on it! A ginger cookie just for me! 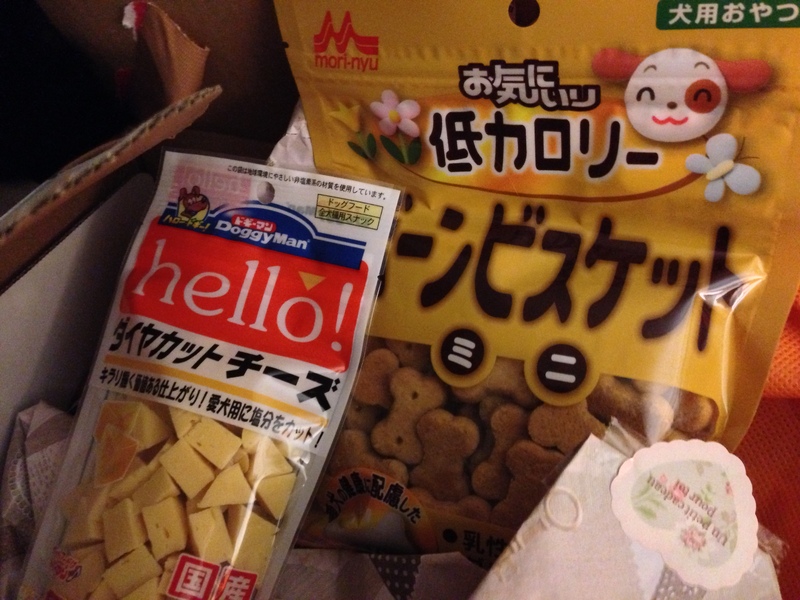 Kevin sent treats all the way from Japan… and he sent presents for everybody! Thank you! I got a squeaky toy and a bottle toy! I LOVE Gotcha Days! Thanks for sharing mine with me! Happy Gotcha Day dear Rumpy!!!! How wonderful day it is today!!!! I’m so glad to you look happy with your family!!! Happy Gotcha Day, Rumpy pup!! 🙂 Enjoy this special day to the fullest. From Popple the Boston/Pug cross. Happy Gotcha Day, Rumpy! I hope you enjoyed your cookie! Happy Gotcha Day pa. Hope it’s a great one. Congratulations!! Happy Gotcha Day. Time sure flies when you are having fun! 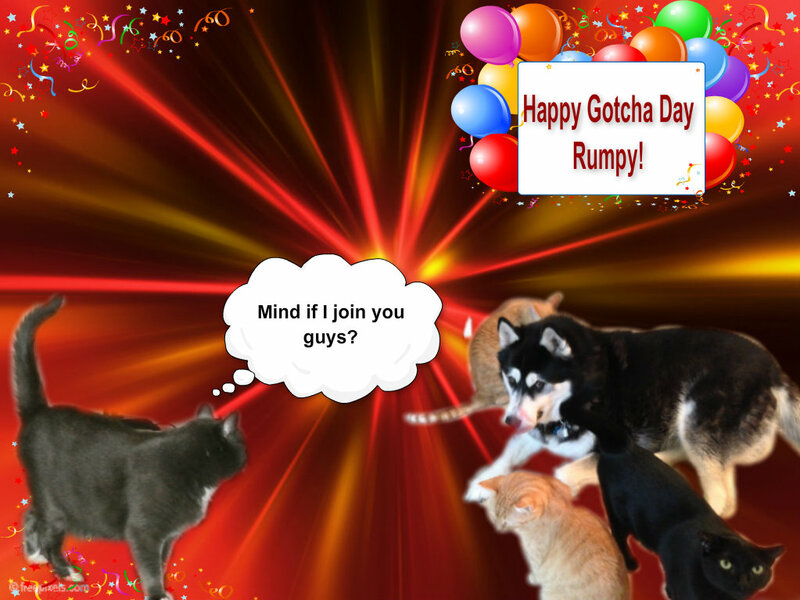 Happy Catcha Day, Rumpy! You are such a lucky boy! Happy Happy Gotcha Day, I hope you have a great day! You are all so lucky you found each other! Happy Gotcha Day Sir Rumpy!!! Happy gotcha day, Rumpy. Furry hugs from all the traveling cats. Bootiful! We wondering what we shall has for Gotcha Day. It upcoming soon! You told me about the name of that day recently, when I had mine, Rumpy, and now it’s the Gotcha Day of your own! Wooohooo!!! Happy Gotcha Day Rumpy!! Happy Dance!!! Happy Gotcha Day, Rumpy! You are one lucky dog! All paws up for Rumpy! Happy Gotcha Day Rumpy! You received some really awesome stuff for your big day! Happy Gotcha Day my sweet boy. I see it is a good one. Wish I could have been there to wear a hat with you! June Buggie didn’t like the hat Grandma! A very happy Gotcha day to you!!! I know Jen is so happy she “gotcha”! Happy Gotcha Day, Rumpydog! My day was last month. Happy Gotcha Day! That ginger cookie looks delicious! Happy Gotcha Day! You got such great stuff – and a great home too. What a lucky dog you are. Happy Happy Gotcha Day, Rumpy! Oh, Happy, Happy Gotcha Birthday Rumpy!!! 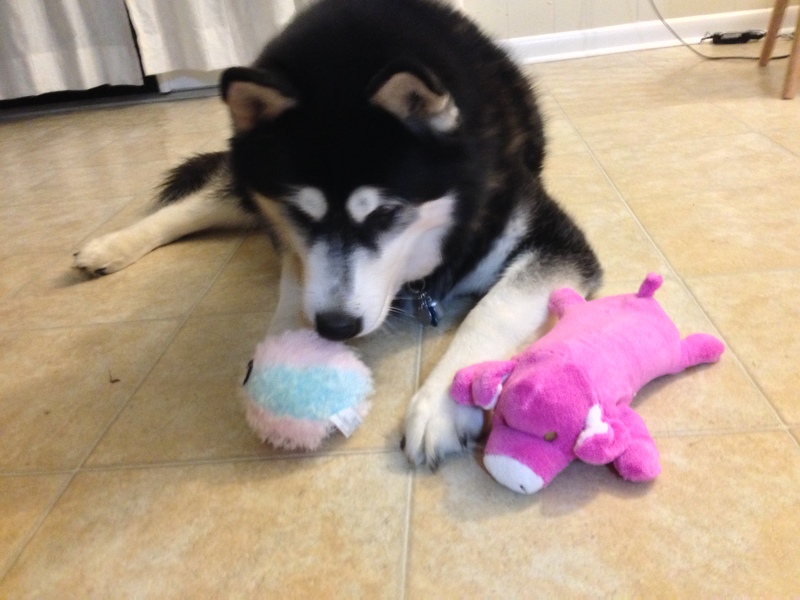 You and DeDe look adorable in your party hats and we love your video…Wolf just raised his head up when you squeaked your toy! Woos and wishes for a pawsome day, a pawsome year, and many, many more wonderful Gotcha Days ahead! Woooo! We love the Hats and the Ginger Cookie with your NAME on it. Have a super WONDERFUL GOTCHA DAY!!! 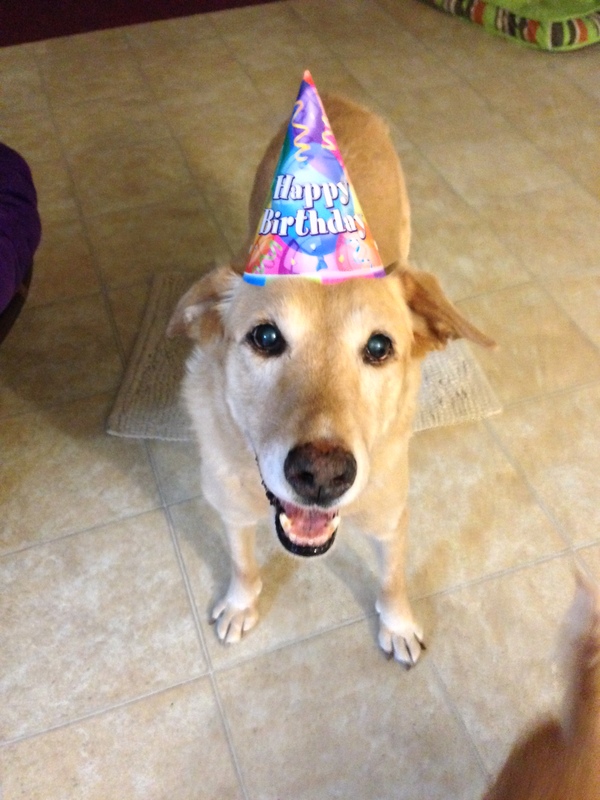 I love those smiles and your party hats too. Happy Gotcha day Rumpy! Celebration time, sweet Rumpy! Happy Gotcha Day. Congraaatz 😀 what a beautiful bone! We love you, buddy, and we hope you had a wonderful gotcha day. Here’s wishing you many, many more! Oh Happy Gotcha Day Rumpy! Looks like you guys had a fun pawty! Happy Happy Gotcha Day….It looks like you and your friends had a pawsome time! HAPPY BELATED GOTCHA DAY!!!!!! I can tell it was a GREAT ONE!! Wow! What a great celebration!! Happy Gotcha Day!! Much love, The Scottie Mom. 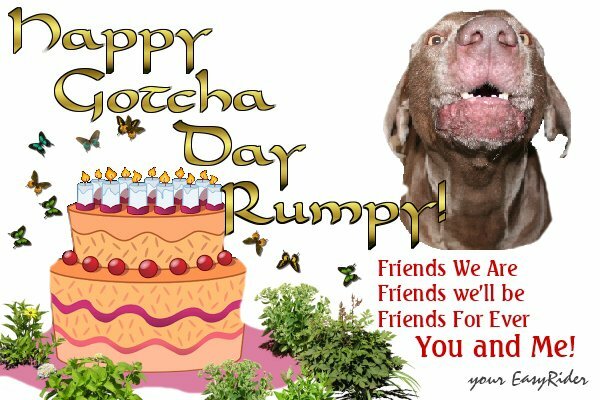 Sorry I’m a day late Rumpy but Happy Happy Gotcha Day with all my love…Gotcha Days are the very bnest and Gotch means you’re loved! Happy Gotcha Day, Rumpy. We haven’t been able to get around to visit much, but we couldn’t miss a chance to send you our good wishes. Happy belated Gotcha Day, Rumpy. Looks like you had a blast! Happy belated gotcha day Rumpy!